Unemployment rates are a limited measure, but they are the focus of most economic recovery stories in North Carolina. Through the lens of the changing unemployment rate, one might conclude that North Carolina has experienced a comeback since the “Great Recession,” since unemployment has gone from “a cyclical high of 11.3 percent in 2010 to 5.4 percent in early 2014.” Think NC First, a non-profit public policy organization, commissioned a report by John Quintero to bring another important indicator into the conversation: household income levels. 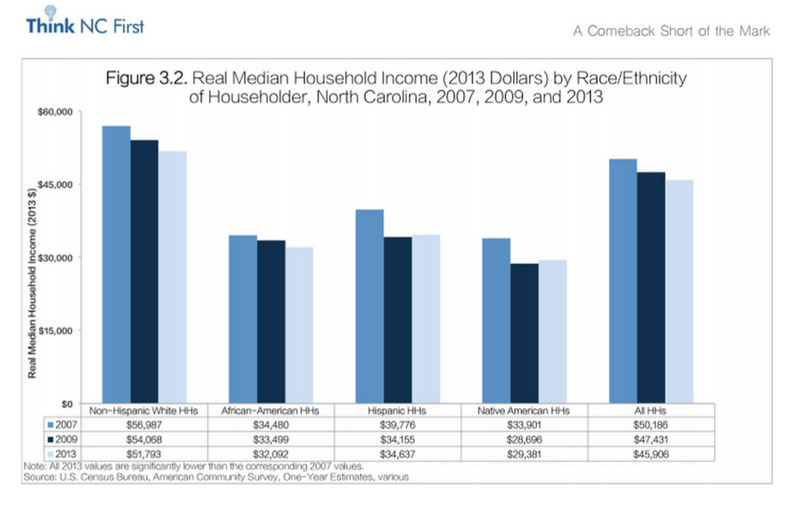 When seen through the lens of median income, one understands that the recovery has not been fully felt by many North Carolina earners. The story presented by John Quinterno of South by North Strategies, Ltd. is less celebratory than the “Carolina Comeback” story being told by politicians. 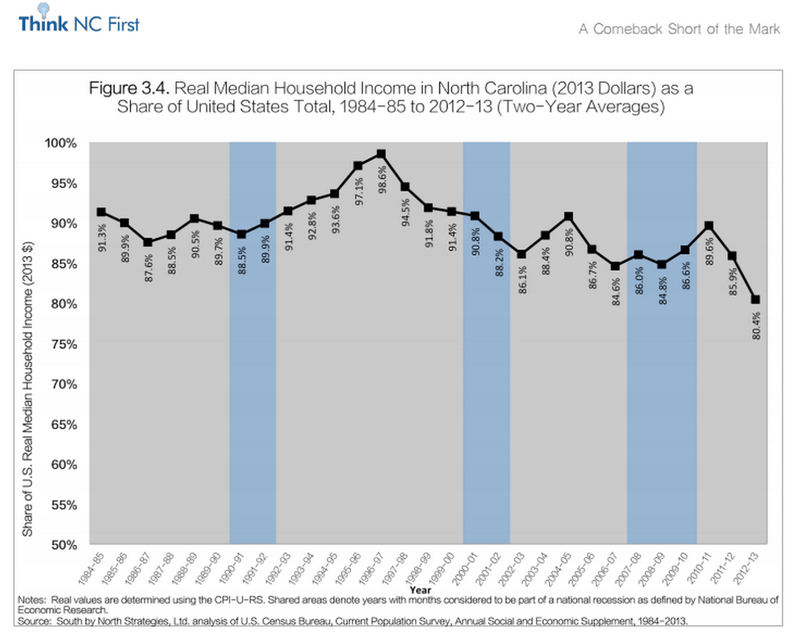 The study found that the inflation-adjusted income of the median North Carolina household dropped by 8.5 percent, or $4,280, between 2007 and 2013, with declines occurring during the business cycle’s contraction and expansion phases. Additionally, the real income of the typical North Carolina household in 2013 was effectively no different than it was in 1984. These findings mean that North Carolina is falling behind the country in terms of average income and racing ahead of the country on levels of income inequality. Mr. Quinterno published an op-ed in Raleigh’s News and Observer following publication of this report. That piece may be found here. He will give a public presentation at UNC’s Working Group on Economic Development at UNC about this report on Thursday, September 17th from 12:00pm-1:30pm in 4003 FedEx Global Education Center. John Quinterno is a principal with South by North Strategies, Ltd., a research consultancy specializing in economic and social policy. His areas of expertise include labor market analysis, data analysis, workforce development, economic development, unemployment insurance, and postsecondary education. Quinterno recently completed his first book, which was published by Routledge. Entitled Running the Numbers: A Practical Guide to Regional Economic and Social Analysis, the book demystifies data concepts, sources, and methods for civic leaders interested in understanding economic and social issues at the regional level. Quinterno earned a bachelor’s degree from the University of Notre Dame and a master’s degree from the University of North Carolina at Chapel Hill. Originally from Rockville Centre, New York, Quinterno resides in Chapel Hill, North Carolina.